The law can be complex. An attorney goes to school for years to train and study legal texts, and to learn the language of the system; it’s easy to understand how some phrases go over the heads of everyday people. Even common words that a person may hear in the context of their daily life; their actual meanings may be unknown. So we’re breaking things down to make you a more informed and educated citizen. You are your best advocate! What Is the Definition of Liability and Why Should I Care About Being Liable? In personal injury law, liability is everything. Liability is the concept of fault, more so the idea of which party involved in an accident bears the responsibility for its occurrence. When someone is held liable for an accident or injury, they are deemed at fault for this accident or injury. When someone bears fault for an accident, they may be held responsible for compensating the injured party for damages in the form of monies awarded. To keep it quick, if you’re liable for an accident occurring, there’s a good chance that it’s going to take money from your pocket, or from the insurance company that represents you, which will ultimately cost you money in the end. – That a “duty of care” existed between the parties involved. A duty of care expresses the acknowledged responsibility that persons have towards each other to act in a reasonable safe manner. For example, all drivers have a general duty of care to those they share the road with. – That a breach occurred in this duty of care. This means that a person involved in an accident acted in a careless manner. – That damages were incurred. Damages can take the form of incurred medical bills, lost wages from time off work, or property damage, among other things. While the idea of liability sounds relatively cut and dry, it can oftentimes be nuanced and complex. Here are several examples of when it becomes more challenging to prove liability and the burden of negligent actions. -Comparative negligence. The state of South Carolina supports the statute of comparative negligence. This is the idea that more than one party may be responsible for an accident occurring; this permits for the amount of compensation an injured person receives to be reflective of the amount that they are responsible for the accident itself. South Carolina statute says that a person can be up to 51 percent responsible for an accident occurring and still be awarded some degree of compensation for damages accrued. Employer liability / respondeat superior. This idea states that a person may not be held personally liable for their negligent actions while working for an employer. In this case, an employer would be held liable for their employee’s actions. – Assumption of risk. We may all be familiar with someone who willingly engages in risky activities- maybe someone who is a daredevil or plays aggressive sports? Assumption of risk is an idea that protects a defendant in a personal injury case. It states that the injured party had knowledge and appreciation of risk and chose to proceed in a dangerous activity anyway. In cases where this is proven, it mitigates the amount of compensation an injured party may potentially receive. – The Firefighter rule. This stipulates that an individual who creates a hazard through an act of negligence, can not be held responsible for the injuries sustained by the emergency worker (like a fireman) who works to combat the hazard. – Trespassing on property. In general, a property owner or occupier can be held liable for injuries sustained to social and business guests through an act of negligence; this can become null and void if the injured party was trespassing. 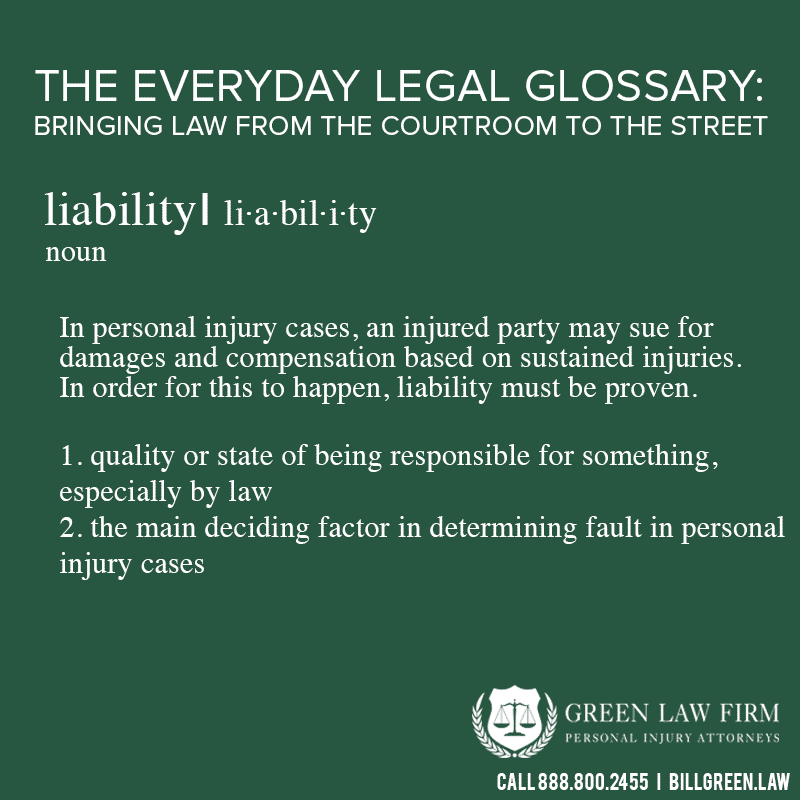 If you have been involved in an accident and have questions about liability, contact the team at Green Law Firm for a 100 percent risk-free case review. The intricacies of your individual case may not be clear and apparent to you. An experienced personal injury lawyer will review the evidence surrounding your case and offer you honest feedback about the challenges you may face as you pursue damages!